What is the Original Sabbath (Rest Day) in the Bible? 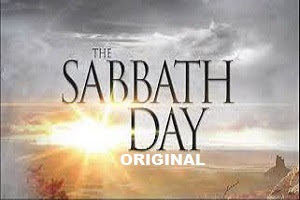 What is the original Sabbath according to the bible? Some sects continue to believe in the principle of the SABBATH'S remains commandments that must be applied to CHRISTIANS. Is the SABBATH remains commandments that must be applied to CHRISTIANS? So, let's give us an opportunity to study the subject so we can answer any questions about this. When did Sabbath observance begin to be ordered? And what is the so-called Sabbath? Exodus 20: 8-11 "Remember the Sabbath day by keeping it holy. Six days you shall labor and do all your work, but the seventh day is a sabbath to the Lord your God. On it you shall not do any work, neither you, nor your son or daughter, nor your male or female servant, nor your animals, nor any foreigner residing in your towns. For in six days, the Lord made the heavens and the earth, the sea, and all that is in them, but he rested on the seventh day. Therefore the Lord blessed the Sabbath day and made it holy." "Six days you shall labor and do all your work, but the seventh day is a sabbath to the Lord your God"
This is equivalent to the so-called "REST DAY" or a day's break from work or occupation, which was then the time of Moses. What is the reason and the ISRAEL is commanded by God to perform SABBATH? Deuteronomy 5:15 "You shall remember that you were a slave in the land of Egypt, and the Lord your God brought you out from there with a mighty hand and an outstretched arm. Therefore the Lord your God commanded you to keep the Sabbath day." The reason why the ISRAEL was ordered to follow the SABBATH commandment because the Israelite were saved from slavery in the Egyptian nation. This is the reason why there was SABBATH on Saturday, for the Jews to remember God's saving time in Moses' day. So here we are clearly able to answer the Question: Is the SABBATH on Saturday remains commandments that must be applied to CHRISTIANS? ANSWER: No, no! because this command is EXCLUSIVE or unique to the ISRAELITE that God saves from slavery from Egypt. This is the law of the Lord God for Israel. But of course, some sects do not allow that, and they will say that Saturday Sabbath is part of the commandments in [Exodus 20: 1-17] that CHRISTIANS must fulfill. So, they said, it is clear that the Lord Jesus has said that he has not come to destroy the law but to fulfill or fulfill it, and because part of the LEGAL COVENANT LAW is the Sabbath, so, it does not happen that Christ will not impose on Christians. 1. The circumcision of the men who were also commanded (Leviticus 12: 3) was not imposed on the Apostles' Christians (Acts 15: 1-32). 2. The law to apply for the love and the love of God (Leviticus 24:20) was also implemented, but Christ made it clear that today's law is not (Matthew 5: 38-39). That's just some of the examples of Old Testament RIGHTS that are very clear in the Bible that are not being applied in Christian times or in our day, that even our other sects friends do not deny that. What does this mean? If there are any commandments that have been damaged or not implemented in the Christian era, then is there a contradiction in the statement of Christ in Matthew 5:17? Luke 24:44 And he said unto them, These are my words which I spake unto you when I was yet with you, that it was expedient for all things to come. THAT IS ABLE TO ABOUT ME ON THE MOUTH OF MOSES, AND THE PROPHETS AND Psalms." Jesus' statement is so clear that there is no contradiction because the commandments he referred to us that must be fulfilled is the commandments that: REQUIRED TO COME TO ALL THINGS ABOUT ME ABOUT ME OF MOSES, PROPHETS AND PSALMS prophecies. Only things about Jesus or referring to Jesus, such as PROPHECIES of MOSES about JESUS, and even written in the SONGS OF SOLOMON. These are the ones he fulfilled at his coming. That is what he meant in Matthew 5:17 that he would fulfill, the LAWS ONLY with his or her CONFIDENCE. Your RESPONSIBILITIES that are not ABOUT him are the LAWS that will not be fulfilled, and that is the many parts of MOISES 'COURSES that are not implemented in the CHRISTIANS. It is evident in the Bible that MOISES 'S CONSEQUENCE has come into force: the Gospel of the Lord has been fulfilled, only at the time before John the Baptist arrives, and this is the beginning of the Christian period, so SABBATH in Saturday, because part of THE MOUTH OF MOSES is no longer enforced by CHRISTIANS. That is the doctrine of Christian, we are no longer subject to follow of MOSES LAW for the Saturday Sabbath. That's why we do not have the Bible to read that SABBATH on Saturday still implement to CHRISTIAN, because it is no longer a LAW or DUTY that applies to them. If there are any questions, please do not hesitate to comment here. God bless!